Congratulations to Julian Scaccia for earning two World Top Ten awards during the 2016 NASKA Tournament season. From the time that Arwen was five years old, she had already expressed an interest in karate. We did not take her too seriously then because at that time, she wanted to do everything. It wasn’t until she did three years of dancing, a year of gymnastics, and a few months of piano lessons, that we realized that she was starting to get bored of those activities and was lacking motivation. In 2012, she won three free trial classes from Team Creek Martial Arts at the Coconut Creek Butterfly Festival. She was so excited that she would finally get to try out karate for the first time, although, I was a bit skeptical. To be honest, I really wasn’t ready my little girl to lose her frilly pink tutu and transform into a rough and tough fighting machine and be like one of those boys in “The Karate Kid”. To my surprise, she loved her first class and she couldn’t wait to go back for another! I saw how her eyes lit up when she talked about it and how happy and excited she was over the fact that there was not just one, but two female instructors at the dojo! Although she was still finishing up her final months of dance, she wanted to quit and start karate right away. That was how enthusiastic she was about this newfound interest. There was no denying the fact that she had found something she loved. Now two years and six belts later, she still loves karate class. The dojo has become almost like a second home to us, having being there at least three times a week. We’re always greeted with a warm smile and a friendly handshake. It has become more than just a place for karate classes, we feel like we are part of a family there. Arwen has benefited in numerous ways through her karate classes. It has given her goals to achieve and work towards, both short and long term. “I want to be like Sensei when I grow up. 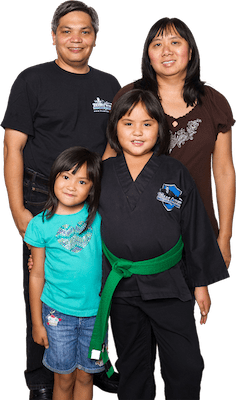 I want to earn my black belt and teach karate too.” She is excited to learn new skills and work with new weapons, and is always looking forward to earning her next belt. The difference between this class and all the other activities she has done in the past is that it constantly gives her something to strive for and this keeps her highly motivated. We can see in her face the amazing feeling of accomplishment she gets when she earns a new belt, or winning an award in a tournament, or even breaking a board. It is the most awesome feeling in the world to know that your child is happy and loves what they are doing. The classes have definitely helped her both mentally and physically as well. She has done extremely well in all of her school subjects, earning her an A Honor roll all year. The karate skills, combined with the self- defense skills, the exercise, all of that has helped her become a stronger person, inside and out. At this point, she is struggling a bit with her running, but we believe that if she works hard and gets over this obstacle, it will help her realize that she is capable of accomplishing anything in life. We know in our hearts that she can do it, she just has to believe that she can do it too. We understand that there will be many more ups and downs on this path, but we are on this path together and with the support of the dojo, we are positive that she will one day wear a black belt with “Arwen Paredes” written on it. We are truly grateful for the dojo and are happy to be part of this family. Our son Ayden started karate at Team Creek Martial Arts when he was 8 years old. Although he was always very physically active and enjoyed playing outdoors, he was resistant to the idea of joining any sport. One day, I took him to Team Creek where he met Renshi (Molly). I was so impressed at how well she was able to connect with Ayden. She introduced him to some karate moves and within minutes, he excitedly asked, “Can I join?”. Boy, was that music to our ears. 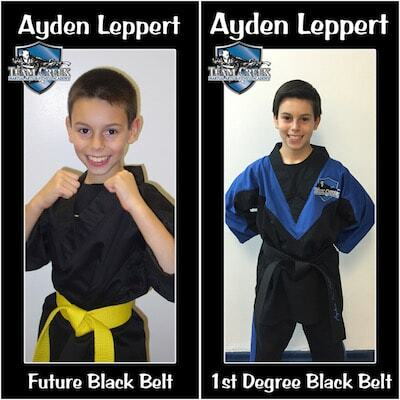 Ayden is now 13 years old and has earned a first degree black belt. Our experience at Team Creek has surpassed our expectations. Shihan Frank Scaccia and Renshi Molly Scaccia are not only amazing and dedicated instructors, they are also positive role models for the children and adults that train at Team Creek. Some of the positive changes that we observed in Ayden over the last few years while training in Martial Arts include being physically, mentally and emotionally strong, as well as confident and respectful. Additionally, he has developed many close friendships and a very positive attitude about life. Although Ayden has already greatly benefited from his experience and training thus far, we know that it is extremely important that he continues to train in order to build a stronger foundation of strength, discipline, self-control and confidence. These important characteristics will help him to make the right decisions when faced with any challenges that may arise, and will help him to succeed throughout his life. After 5 years in Martial Arts, we never get tired of watching Ayden train in class or perform at demonstrations. His skills, confidence and enthusiasm make our hearts smile. We are grateful for what Team Creek has done for Ayden and we feel blessed to be part of the Team Creek family. 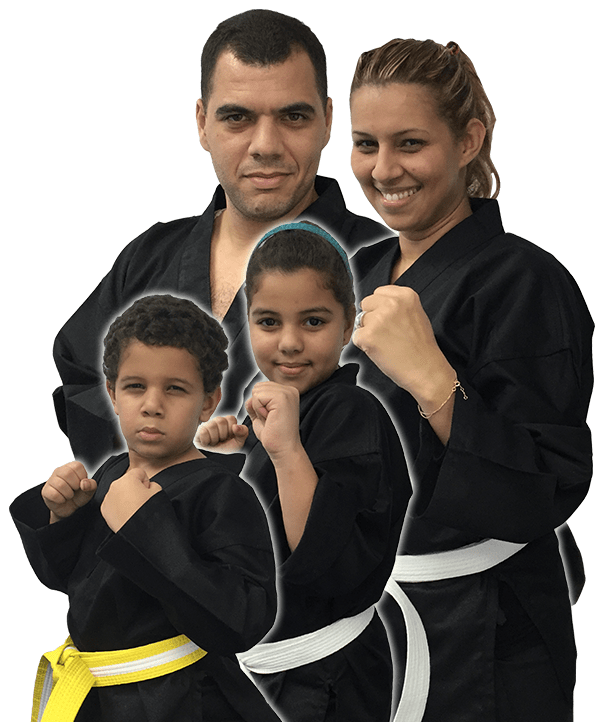 It's been about 8 Month since I enrolled my 2 little ones, Rayan & Lina to team creek martial arts & fitness Academy in Coconut Creek. I also joined around the same time. It was not too far along after that the impossible happened.......My wife joined also!!!! With the guidance and support of the 2 most dedicated, driven and simply put magnificent instructors (Shihan Frank Scaccia & Renshi Molly Ann) along with their 2 super star sons (Julian & Matteo), I was able to lose 35lbs in just 3 months! I can honestly say that I am in the best shape of my life.......and still improving!! My two kids have shown vast improvements in all areas including respect, focus, behavior, confidence and of course their overall health and fitness. It is truly amazing to see how much they have grown and improved in such little time. I had done some martial arts in my teenage years and I have to say, those core values along with all the self defense moves always stayed with me and made me who I Am today. I strongly urge all parents who are looking for something to help their kids and themselves to improve with health & fitness but also to grow mentally, physically and spiritually to take up martial arts!